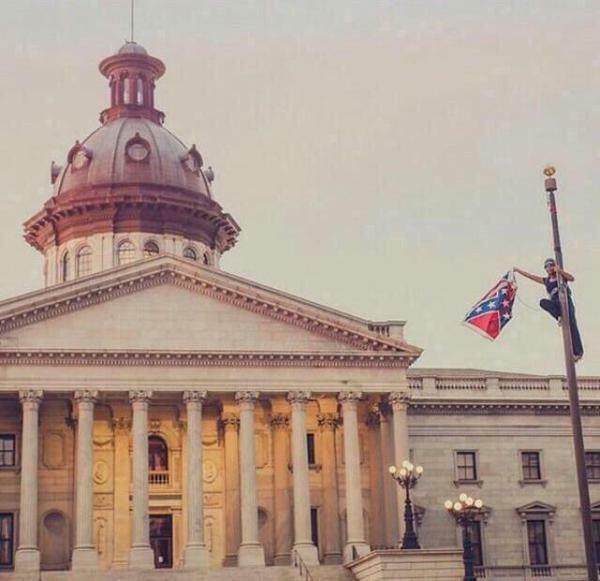 Bree Newsome waves the Confederate battle flag from atop the flagpole outside South Carolina’s Capitol Building. Photo: Adam Anderson via Bipartisan Report, Twitter. A lot of people I know skipped church last weekend. A lot of Black people I know skipped church last weekend. A sprinkling of days after a young White racist slaughtered nine praying Black people in the oldest African Methodist Episcopal Church in the South, a lot of sweet souls skipped church, and I was tempted to be one of them. Brokenhearted, I was tempted to crawl back under my summer blanket and wail in the timeless language of tea and chocolate and fitful sleep. Instead I rose and put on a dress shirt instead of sackcloth, and I went to the morning service at my congregation. Tywanza Sanders, 26 years old. Clementa Pinckney, 41 years old. Sharonda Coleman-Singleton, 45 years old. DePayne Middleton Doctor, 49 years old. Cynthia Hurd, 54 years old. Myra Thompson, 59 years old. Ethel Lee Lance, 70 years old. Daniel Simmons Sr., 74 years old. Susie Jackson, 87 years old. Their bodies will be buried this week. Black churches are burning across the South. And the most my congregation could say was “racial stuff.” We couldn’t even say their names. At Rev. Pinckney’s memorial service on June 26, President Barack Obama praised him as a good man who gave his prime years to religious and public leadership, to both preaching and protest. The president noted what inspired Pinckney to serve the communities beyond his congregation: the Black Church has always sent its servants out into the world. Pinckney’s persistent faith, Obama said, drew on the same spirit that inspires the U.S. to expand its freedoms and policies of care, and to account for a wider circle, not a narrower one. The faith and grace of God is in that movement. Obama unsteadily sang “Amazing Grace”; the organist helped him, and the church said Amen. Last weekend, I couldn’t have sung with them. This weekend, the release of song still feels alien. As I watched the C-SPAN funeral feed on Friday night, it hit me that Clementa Pinckney was the same age as my sister. Six days after that supremacist killed him and the other Emanuel members, a third member of my sister’s generation, a friend, mother, wife, and the senior minister of one of my churches, “put on invisibility” and passed away. In my fatigue over the last 10 months of relentless Black Death, and my sadness at the passing of my friend and mentor, I find myself far less awed by the “amazing grace” invoked at the Pinckney funeral and far more amazed at the apathy of the faithful. It was amazing apathy, not grace, that kept John Newton comfortable in both slavery investments and Christian preaching for forty years before an English politician introduced him to abolitionism. How was it that the word he preached failed to awaken him to the sacred life of his African siblings? And the AME denomination, the oldest independent Black denomination in the world—how is it that the word that the AME denomination has preached since 1816 hasn’t yet transformed it into an advocate for all Black lives, not just some? The U.S. Supreme Court has ordered equal access to civil marriage, and LGBT-antagonist church folk struck up apocalyptic mourning chants as soon as the decision hit SCOTUSblog. 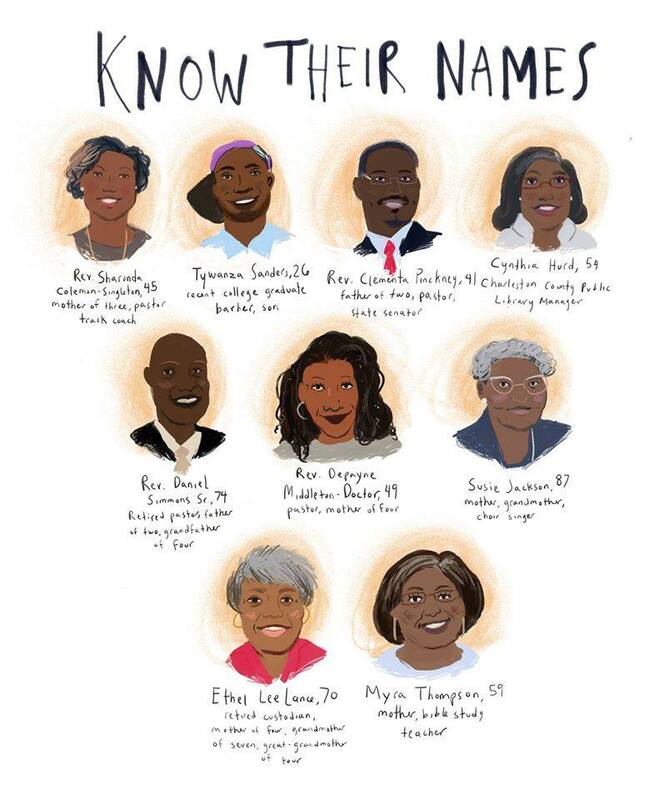 The Emanuel 9 deserved more than limp euphemism. We deserve more than apathy in the face of inequity. This Saturday as I ventured out to church again, Bree Newsome and James Ian Tyson brought the Confederate battle flag down from its mast in front of the South Carolina Capitol complex. Shortly after their arrest, two Capitol employees raised it again. One of the flag-raisers was Black. After Newsome’s and Tyson’s arrest, South Carolina residents rallied outside the capitol to “Defend the Flag.” The scripture-quoting pole-climbing film-making Black activist woman and the man who spotted her on the pole had never allowed the battle flag to touch the ground: they offered the Confederate soldiers’ emblem far more respect than the secessionist movement ever claimed for them. As South Carolina’s flag came down, battle flags west of SC went up: Alabama crowds drunk on nostalgia took to the streets to declare that they, too, matter and they wished they were in Dixie. As I saw the stories about Newsome, Tyson, and the battle flag coming down, the flag action bail fund ticked past $30,000, $40,000, $60,000, then $100,000. I saw the spirit of Anansi at work. Kwaku Anansi is the trickster, shapeshifter, and storykeeper of the Akan diaspora. He brings wily, situational wisdom, prudence, and cunning skill to the inequitable world of the animals, that world where Tiger is king and expectations of spiders are low. The Greeks called Anansi’s gifts metis, but I grew up seeing empire-identified critics fretting over whether we should tell Anansi tales to children and blaming the spider-man for inspiring social fraud and corruption. They were wrong. Anansi is worthy of honor. And when spun into action like spiders’ silk, Anansi’s metis is a beautiful and powerful thing. And so he uses his intelligence to find a way. He appeals to Snake’s beliefs about himself, and with all his wits and hearts and guts, Anansi gets what he wants. “You come against me with hate and oppression and violence,” Newsome shouted from the middle of the flagpole. “I come against you in the name of God. This flag comes down today.” And it came down. Anansi targets Tiger’s and Snake’s false pride and no one is harmed. A scripture-quoting woman climbed a pole and made the SC Capitol and its sluggish legislators look foolish. It was the most straightforward solution I think she could have found, and it had good precedent. Not allowed to eat at a restaurant? Go sit at the counter and wait out patrons’ fury. Banned from the front of the bus? Don’t use any buses until you’re free to sit where you please on any of them. Tired of legislators stalling and want the secessionist battle flag to come down? Go up and get it yourself, and wear safety gear. In the late 1940s, theologian and activist Howard Thurman described trickster wisdom as “perhaps the oldest of all the techniques by which the weak have protected themselves against the strong” (Deception, Jesus and the Disinherited , p. 58-69). As he points out, “deception” only appears in unequal relationships and in groups and societies that resist overt challenge to their symbols and structures. Thurman didn’t advocate deception: he feared that double meanings, duplicity, and feints degraded marginalized people and put them at risk for moral compromise. But the cunning surprises that worried Thurman aren’t the only quality Anansi brings with him. The adaptability and resourcefulness of metis also showed up in Newsome’s and Tyson’s direct action yesterday. Both activists were absolutely measured, calm, and intentional, and they confounded the expectations of a system that has responded to #TakeItDown/#KeepItDown with “We’ll discuss it next legislative session.” In the meantime, the system only recognizes passive compliance and submission. Passive compliance will not do in this season. Newsome and Tyson cooperated with police but were never once out of control. They made the pole-climb a craft (technê). Their team documented the action meticulously. And they promise there will be more to come. We immunize ourselves against fear. We know that we are the children of heaven and earth, that we belong, that we merit existence. We know that self-hate is worse than death and that even death cannot conquer our story. All the while, we live in contexts that deny our humanity, our magic, and our trauma; that expect us to keep producing through pain; and that have the gall to fly supremacists’ battle flags over our coffins. One hundred and fifty-two years after emancipation, the system still hasn’t digested that we are no one’s inferior. And so we use the gifts of Anansi. Euphemism can’t get us to clarity now. A teacher told me last week that every new headline of murder or arson is another call to know and speak the truth. She was right. Choosing the filthy rags of euphemism over the salve of truth can only delay our healing: all our euphemism is like filthy rags, and if there’s any social institution that should understand what this means for our “salvation” as a country, it’s the Christian church. A sector of the US Adventist church recently apologized for the racism that launched it 70 years ago. Current leaders recognized that though they were not culpable for their predecessors’ wrongs, they were responsible for the system they inherited and steward today. That’s part of what knowing and speaking the truth can do. While I kept up with the flag action on Saturday, I also saw that the National Cathedral’s dean had called for the removal of two Civil War stained windows. The National Cathedral is one of my favorite churches in the world: it took more than eight decades to build and the designs of its windows reflect that history. I can’t agree with the dean that we should remove these panes. I do agree with him that we need historians to help us re-frame the windows with a thoughtful contextual display. As I said on Saturday, the natural fractures exposed during the Civil War persist in new forms in contemporary US politics and politicians. We can’t gut living history and think no one will notice. Racism is neither dead nor extreme, and we have to tell the truth about it.